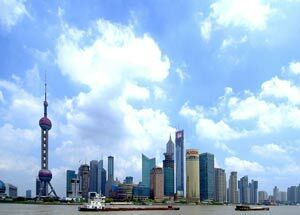 The Port of Shanghai, located in the vicinity of Shanghai, comprises a deep-sea port and a river port. In 2005, with a total of 443 million tons of cargo transported, it became the world's busiest port by cargo tonnage for the first time. The Port of Shanghai faces the East China Sea to the east, and Hangzhou Bay to the south. It includes the heads of the Yangtze River, Huangpu River (which enters the Yangtze River), and Qiantang River.